Do not heat the vehicle body, emblem and name plate excessively. When removing the emblem and name plate, heat the vehicle body, emblem and name plate using a heat light. Put protective tape around the emblem. 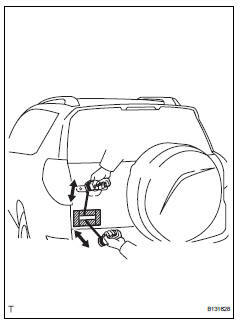 Insert a piano wire between the vehicle body and emblem. Tie objects that can serve as handles (for example, wooden blocks) to both wire ends. Pull the piano wire and scrape off the double-sided tape that holds the emblem to the vehicle body. Put protective tape around the name plate. 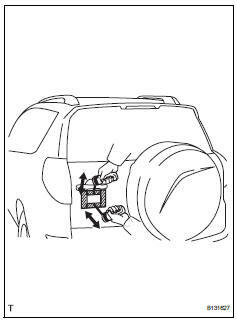 Insert a piano wire between the vehicle body and name plate. 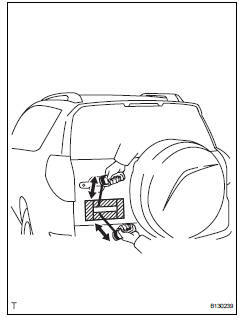 Pull the piano wire and scrape off the double-sided tape that holds the name plate to the vehicle body. If reusing the name plate, take care not to damage the name plate.